No, no, I'm not talking about religion. I'm talking about laundry detergent. I was shopping recently and came across this concentrated form of All laundry detergent. Gotta love the name they chose - "all small and mighty" - and in some clever marketing, they made the "all" and "mighty" in a larger font so if you glance at it you'll just see "all mighty". And who can resist a detergent with god-like powers? Heck, I was compelled to buy it for that very reason. Well, not really. I just liked the smaller size - less plastic packaging, less room taken up in my closet, etc. And the bottle is quite small compared to the equivalent portion of regular laundry detergent. In the picture above, both bottles contain enough detergent for 32 loads of laundry. 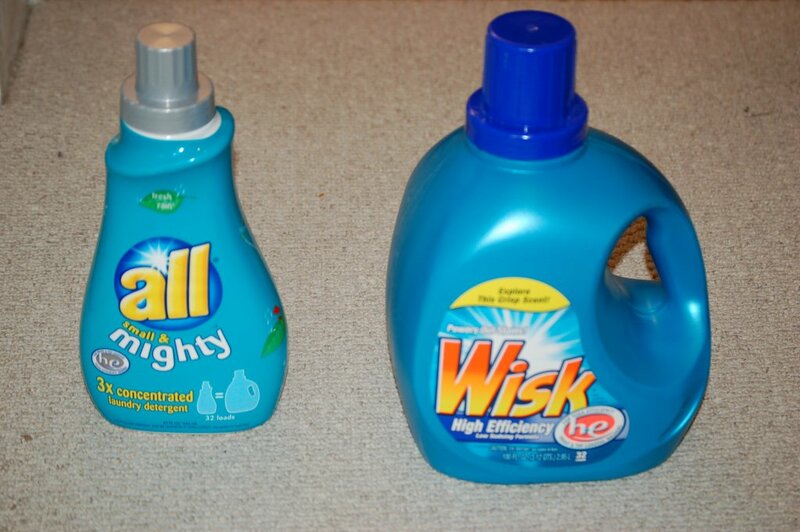 The all mighty bottle is slightly less than 1/3 the size of the regular laundry detergent bottle (32 oz vs. 100 oz).